Swan's Island has learned to appreciate its historic resources after seeing them threatened. In 2008, a fire at the island's library destroyed photographs, documents, artwork, artifacts, and other priceless pieces of island history. Since then the island has banded together to preserve what remains. We have digitized and cataloged photographs, expanded our collection, and recorded oral histories to save our island memories. Click the links below to read about our busy workers! 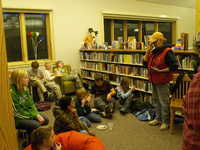 The Maine Community Heritage Project (MCHP), a partnership between Maine Historical Society and Maine State Library, is an innovative program that promotes collaboration between local schools, historical societies, and public libraries through the exploration and celebration of local history. The MCHP grows out of Maine Memory Network, Maine Historical Society’s nationally recognized statewide digital museum. Maine Memory Network features a constantly growing online collection of more than 30,000 historical items contributed by more than 260 historical organizations around Maine; more than 200 online exhibits that explore a diverse range of themes and topics in Maine history; Maine History Online, a comprehensive survey of Maine history organized by time period and them; lesson plans; a gallery of student history projects; online tools that allow site visitors to create and share their own albums; and much more. The MCHP is supported by the Institute of Museum & Library Services.